Let's face it: Subcompact crossovers aren't known for their blistering acceleration or high-grade interiors. In fact, some can be quite slow and quite Spartan. From the Toyota C-HR we've clocked hitting 60 mph in 10.8 seconds to the well-worn cabin of our recent long-term Mazda CX-3, there's often at least one quality that makes a subcompact crossover feel a little less polished than other vehicles. That's what happens when automakers try to keep costs low. 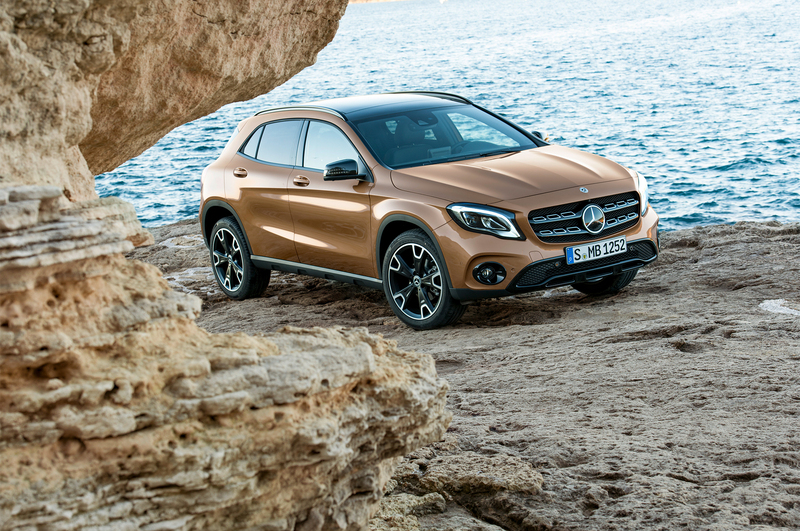 Generally, premium offerings fare better, and the Mercedes-Benz GLA250 is no exception. Although not without faults, the little hatch has personality that keeps us wanting to come back for another spin. The GLA receives a minor refresh for 2018 (a European-spec GLA is shown here). Mercedes reworked the bumpers, slapped on some new wheels, and refined the interior with a new instrument cluster design and standard rear camera (finally). Other than these changes and a few other updates to the features list, the car is largely the same, including the 2.0-liter four-cylinder making 208 hp and 258 lb-ft of torque. It's as nimble to drive as it always has been. The crossover performed similarly to its competitors in our battery of tests. 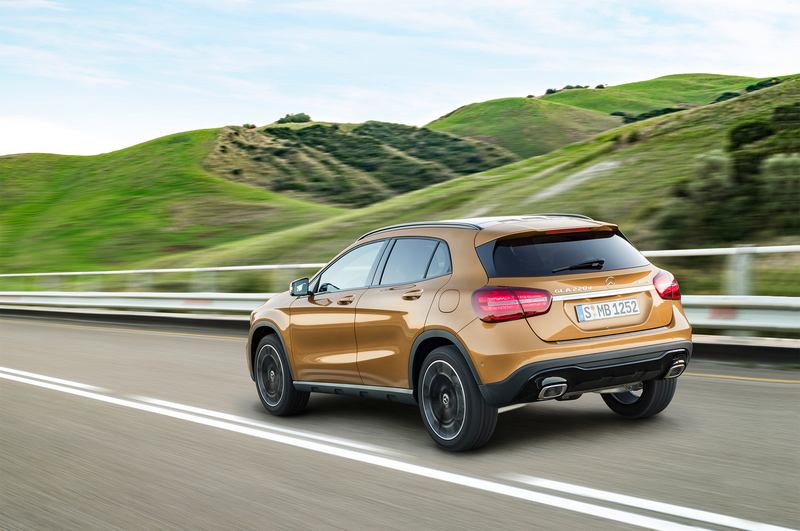 The GLA250 completed the 0-60-mph run in 6.9 seconds, close to the 2016 BMW X1 xDrive28i that hit the mark in 6.8 seconds. The GLA's platform mate, the 2017 Infiniti QX30S 2.0T, proved the quickest of the bunch. It skated to 60 in 6.3 seconds, though that car had front-wheel drive unlike our Mercedes and BMW testers. 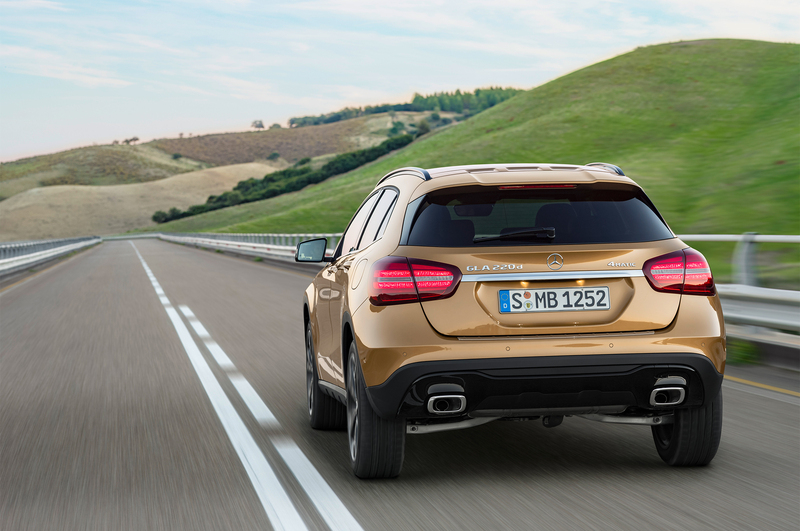 In the quarter mile, the GLA250 managed 15.3 seconds at 90.3 mph. That time comes close to the BMW's 15.2 seconds at 90.5 mph, and the Infiniti clocked a time of 14.9 seconds at 93.7 mph. 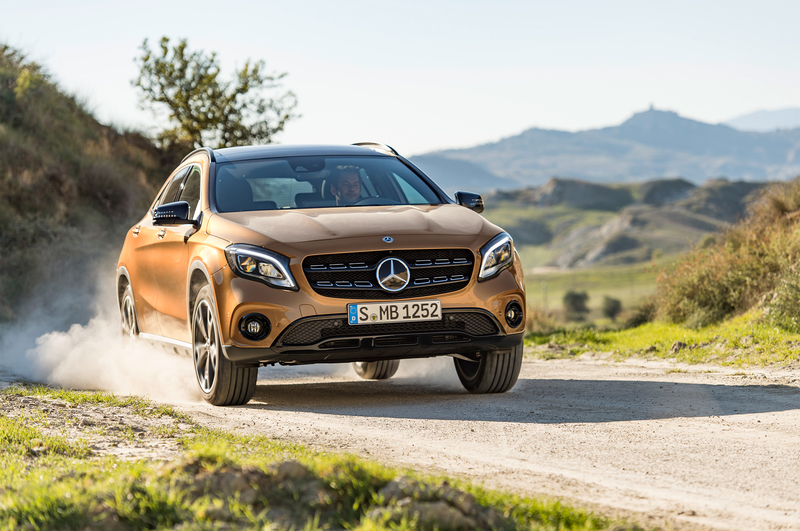 In the figure eight, the GLA sashayed around the curves in 26.6 seconds at an average of 0.67 g, compared to the BMW's 26.8 seconds at an average of 0.65 g and the Infiniti's 26.1 seconds at an average 0.71 g.
Numbers aside, handling is what makes the GLA250 enjoyable to drive. It takes corners well and makes tight turns, particularly in Sport. Its smooth seven-speed dual-clutch automatic transmission adds a bit of refinement to the drive experience, marred only slightly by some road noise that makes its way into the cabin. 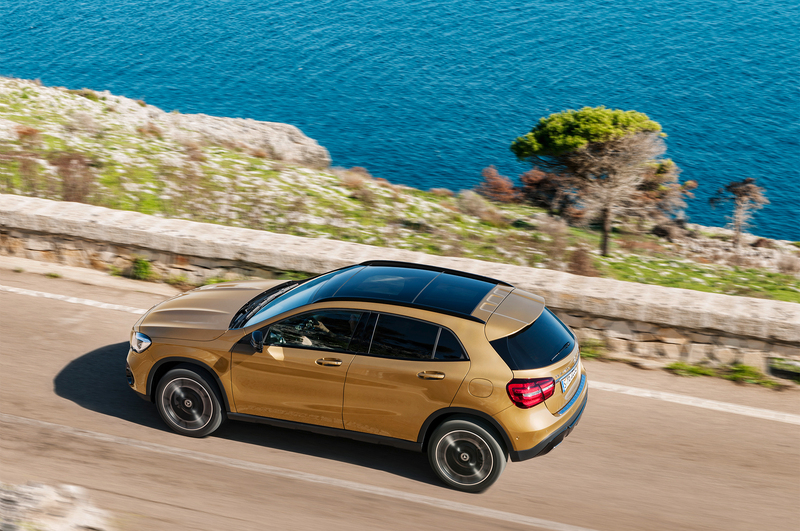 Although it's agile roaming around town, the GLA250 isn't the car that will thrill you at full throttle, thanks to some initial lag when pressing down firmly on the gas. Fortunately, it becomes punchier in Sport mode, though the jumpy throttle response can take some getting used to. Comfort mode will suit those who want a more relaxing drive, but switching to Eco makes the car sluggish. Meanwhile, the ride can be a little stiff. While driving the little crossover one weekend, associate online editor Stefan Ogbac noticed a lack of ride comfort over potholes and other road obstacles. 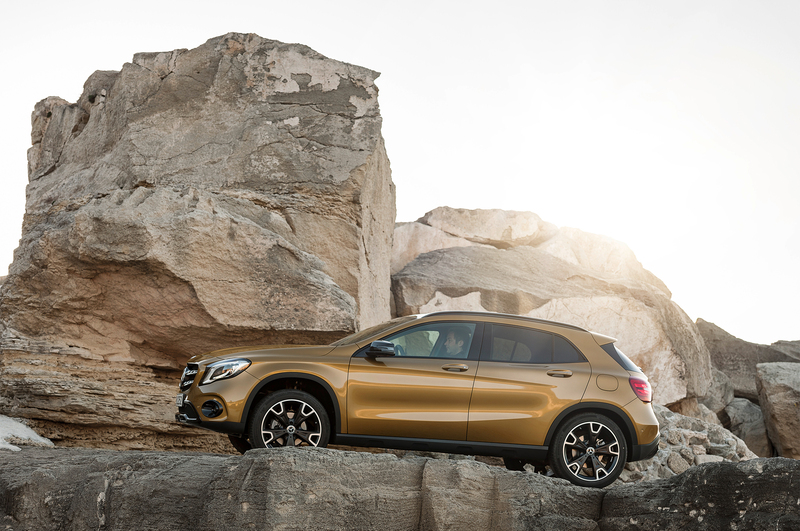 "Over smooth roads, the GLA250 rides fine, but it's definitely a little too firm for its own good and its handling doesn't justify a ride that harsh," he said. Step inside, and you'll find a visually inviting cockpit. Metallic surfaces mix with leather that is soft to the touch (wood trims are also available as an upgrade). It's important to mention our model came with a host of extras including a special interior package with leather sport seats, a multimedia package with navigation and DVD player, an AMG package with bolder body styling, a Night package with subtle black exterior accents, and a driver assistance package. We even had to spring for heated front seats, satellite radio, and smart key. Prices for the GLA start at just above $34,395, but with all the options, our model rang up to $50,215. There's only one major visual cue of cost cutting: the plasticlike door locks mounted below the windows. A point of praise: unlike many small cars, the GLA features nice big side mirrors that help drivers see their surroundings on the road. The seats may please the eye, but we did notice they're overly stiff. "The optional sport seats with fixed headrests have great side support, but I wouldn't want to be in them for a long drive," Ogbac said. "They're needlessly hard, and there's not enough height adjustment, meaning tall people might have a hard time getting comfortable in here." As long as automakers try to meet a low price point, subcompact vehicles will have their limitations. That said, the GLA is probably one of my favorites in the segment. Its responsive handling, attractive exterior and interior, and quick reflexes might be enough to make me overlook its harsher-than-normal ride. 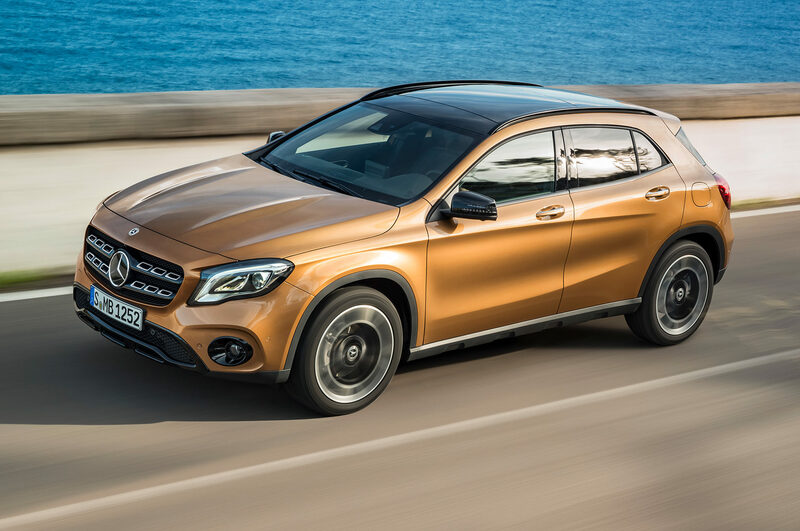 If you put me in a Mercedes dealership, though, it would be hard to steer me away from the GLA45, which as we've said in the past, is a "riot on wheels." It's on a whole other level of driving fun, and we've clocked it hitting 60 mph in just 4.3 seconds.